For some parents, raising a teenager could be a form of probation. Truly, helping rule-breakers, boundary-pushers, and masses of emotions and hormones navigate the world is no easy task. So when Maureen Gullet’s 14-year-old daughter, Rosemary, went missing one night, the Oregon mom assumed it was just one of the many hiccups in raising a rebellious teenager. When the teen didn’t come home at all, however, Maureen knew something more than teenage hormones was at play. Raising a teenager can be difficult. Young adults are moody, combative, and rebellious as they try to navigate their way through the world while experiencing a complex array of emotions. Portland, Oregon, resident Rosemary Gullet, 14, was no exception. When Rosemary didn’t return for more than two days, real panic set in. Maureen filed a missing persons report and called the authorities, who simply assumed that Rosemary had just run away. Maureen never truly bought the notion that her daughter would run away for that long. Her instincts turned out to be correct once Rosemary’s disappearance stretched from days to weeks to months. There was no no way her daughter had simply run away. Still, without any evidence left behind, authorities didn’t have many leads. The situation suggested she’d run away, and investigators stuck by the claim. Fortunately, as months passed, people began coming forward with relevant information. Various friends and family members claimed to have actually seen the young teen around town. Strangely, though, anytime they tried to approach her, she apparently took off running. On the surface, the pictures were simple selfies, taken in front of the mirror. But Maureen saw something else in the photographs that unsettled her: her daughter looked like she acting differently. Rosemary had dyed her hair again, but the most alarming difference to Maureen was her daughter’s smile. To an experienced mother, this one looked fake—almost as if it was the result of threats of violence or abuse. Stuck in a nightmare situation, Maureen’s thoughts turned to the worst. 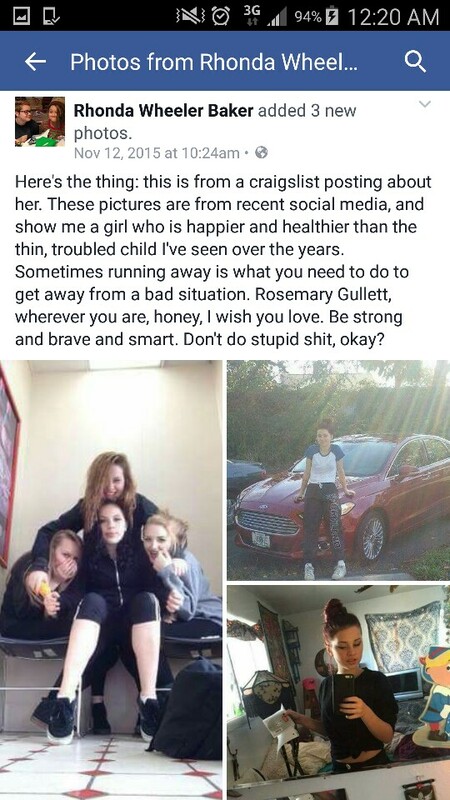 Had her daughter been the victim of human trafficking? The only thing that made sense to her was that Rosemary had been kidnapped. Why else would she have never come home? Human trafficking is not as uncommon as you might think, either. Even in developed countries like the United States, criminal enterprises take children, teenagers, and adults in order to force them into unscrupulous or physical labor. As bleak as the situation looked, the emergence of those Rosemary photographs lent Maureen a speck of hope; they were the first and only clues she’d had since her daughter disappeared. But as weeks passed since she found them, no further images or evidence surfaced. When authorities questioned her, however, they found no evidence she’d been trafficked. She had run away—where to she wouldn’t say—and she just didn’t return. Even stranger than the fact that Rosemary seemed as happy as could be in her “new” life was where Rosemary is now. Today, Rosemary and her siblings are in foster care. Despite a vocal presence on Facebook during the search, Maureen and David have become strangely quiet about their daughter’s discovery. Did something happen at home to cause Rosemary to run away? Where had she gone? Why was she now in foster care? The entire situation was shrouded in mystery. At least, in the end, Rosemary appeared to be safe. It seems that there is more to this story than authorities or the Gullets are letting on, but one thing is for certain—this goes far beyond a mother’s typical conflicts with her teenager! Share this missing teen’s mystery with your friends below!